The Japanese government downgraded its assessment of the economy last Wednesday following a similar move by its central bank the previous week. Notwithstanding the initial hype which surrounded it, Prime Minister Abe’s economic agenda—so-called Abenomics—is now a dead letter so far as any economic revival is concerned. Growth has continued to contract while wages remain stagnant. In a sign of investors’ lack of confidence in the government’s economic measures, the yield on 10-year Japanese Government Bonds has dropped to a record low. This follows the decision by the Bank of Japan at the end of January to charge banks at a rate of 0.1 percent for any new deposits they placed with it. The aim was to try to force the banks to lend to the real economy but all that has happened is that they have put their money in government bonds, forcing up the price and lowering the yield, which move in an inverse relation to each other. 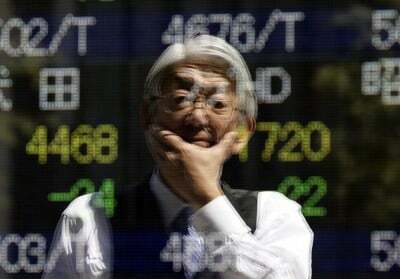 The yield on the 10-year Japanese Government Bond (JGB) fell to minus 0.135. This means that if a purchaser held the bond to maturity they would make a negative real return on their investment. The aim of the bond purchaser, however, is to find someone who will pay an even higher price for the financial asset—the “bigger fool” theory—and thereby enable them to make a gain on its sale. Twenty-year bonds also fell by 0.1 percentage points [10 basis points] but remain in positive territory with a yield of just 0.29 percent. The movements in financial markets are a reflection of the confusion over the direction of the economy and the growing sentiment that the government has no viable program. Consumer spending reflects the same trend as households cut expenditure, fearing the introduction of negative interest rates means the economic outlook must be worse than they had thought. Despite the contraction of the Japanese economy at an annual rate of 1.1 percent in the fourth quarter of 2015, BoJ Governor Haruhiko Kuroda argued on March 15 that his agenda was working. “Since we brought in minus rates, short and long-term bond yields have fallen and that has clearly fed through to falls in mortgage and lending rates—so on the interest rate side the effects are already clear,” he said. Others are not so sure. Economy Minister Nobuteru Ishihara said the effects of the interest rate cut were still not clear and it would take another three months to gauge the result. The BoJ is also considering other measures, including expanding its quantitative easing program by increasing its purchases of financial assets from their present level of 80 trillion yen annually. But the 5–4 vote on the governing council to bring in negative rates show there are significant divisions and uncertainty. Abe came to office in December 2012 promising to revive Japan’s long stagnant economy. His proposed “Abenomics” would introduce three “arrows.” The first was a limited package of stimulus measures while the second arrow was the quantitative easing program. Ultimately though, the Japanese bourgeoisie is demanding austerity measures. The “third arrow” of Abenomics was unveiled in the summer of 2014. It contains more than 200 pro-market restructuring measures, attacking the social position of Japanese workers, lowering the corporate tax rate into the 20 percent range and moving to eliminate lifetime employment. Abe is also planning to further increase the consumption tax. “Monetary policy to overcome deflation and the structural reform [the third arrow] to raise the potential growth rate must be pursued in tandem to bring Japan’s economy back on track toward sustained growth,” he said. The highly unpopular increase in the consumption tax is another attack on workers. In 2014, it rose from 5 percent to 8 percent, sending the economy into recession. A planned increase to 10 percent is scheduled for April 2017. However, calls for Abe to delay the increase have become louder recently. While the prime minister currently states the government plans to go ahead with the scheduled tax rise, it is widely speculated that he will announce a postponement at or following the G7 summit, scheduled for May 26–27 in Japan. For workers, wages have remained stagnant with the median wage level remaining almost entirely unchanged in the past 20 years. Toyota this year has agreed to a paltry basic wage increase of 1,500 yen ($13) a month compared to 4,000 yen last year. This has led to calls from the International Monetary Fund (IMF) for a “fourth arrow;” measures to increase wages in order to achieve the desired 2 percent inflation rate. However, to offset the company’s lost profits, the IMF also suggested tax incentives for companies that raise wages. There is also talk that Abe may dissolve the lower house of parliament to hold a double election along with that scheduled for the upper house in July. Abe similarly called a snap election in November 2014 after delaying the tax increase scheduled for October 2015. With the opposition in Japan largely in disarray, the ruling Liberal Democratic Party (LDP) would likely take both houses, allowing Abe to use the election as a referendum and justification for his agenda.